I remember Black Friday 2014 was another successful Bourbon County hunting trip. One store in my area actually got Vanilla Rye, but we were completely shut out of Bourbon County Coffee. I don't know if they made more this year, or if my stores just got lucky, but in any case, I am a happy camper in 2015. Taking the standard BCBS and adding (for 2015), Intelligentsia Los Delirios coffee beans, this variant of BCBS is one of the highest rated across all boards. Pours pitch black and is even dark as night on the edges. There's no light getting through this at all. The pour generated barely any head, but what was there was a dark khaki color. Classic BA stout on the nose with tons of sweet bourbon in your face and really high-end, decadent coffee beans. On the back is some slight oak/wood and just the slightest bit of vanilla. The standard BCBS was heavy on the bourbon, tobacco, and charred wood. The addition of coffee beans seems to have neutralized the tobacco and smoke and replaced it with rich, rich espresso and mocha as chocolate and intense coffee are working in tandem with the barrel on this one. Think of a higher-end Kahlua with a sweet bourbon kick. 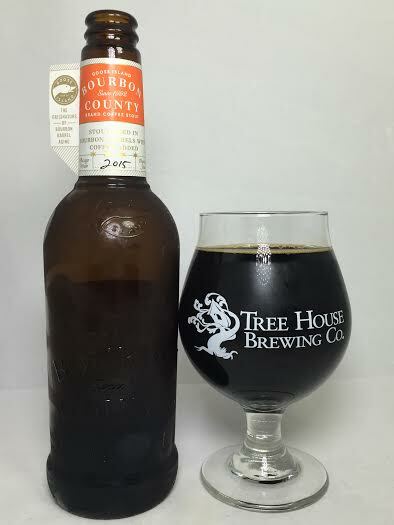 Some of the dark fruits (raisins, plums) from the standard BCBS are here, but efinitely the biggest distinction between the two is BCBS's tobacco and smoke being replaced by coffee, vanilla, and almost a marshmallow or cream taste which makes for a stellar dessert beer. Mouthfeel is spot on as this is thick and viscous. No alcohol taste for a massive abv BA stout and the aftertaste is all coffee and bourbon. The lingering coffee is a welcoming addition as compared to the standard BCBS's dark fruits and bourbon. Bourbon County Coffee adds a new element to an already superb barrel-aged stout. The addition of those rich coffee beans does make an astronomical difference as the coffee teams up with the massive amounts of bourbon and chocolate to make a highly drinkable dessert beer worthy of enjoyment after a big dinner. Just take high-end coffee and add it to the high-end bourbon and that's pretty much what you get from this beer.